A team of researchers with the Swedish Natural History Museum and Uppsala University has found evidence of hopping by a 20-million-year-old kangaroo relative. In their paper published in the journal Royal Society Open Science, the group describes their study of fossils unearthed in northwest Queensland, Australia, and what they found. Scientists have been puzzling over the history of kangaroo hopping for many years—because of the lack of kangaroo fossils older than 2 million years, though, it has been difficult to pinpoint when they evolved from walking or climbing creatures to animals that stand upright and get around by hopping. 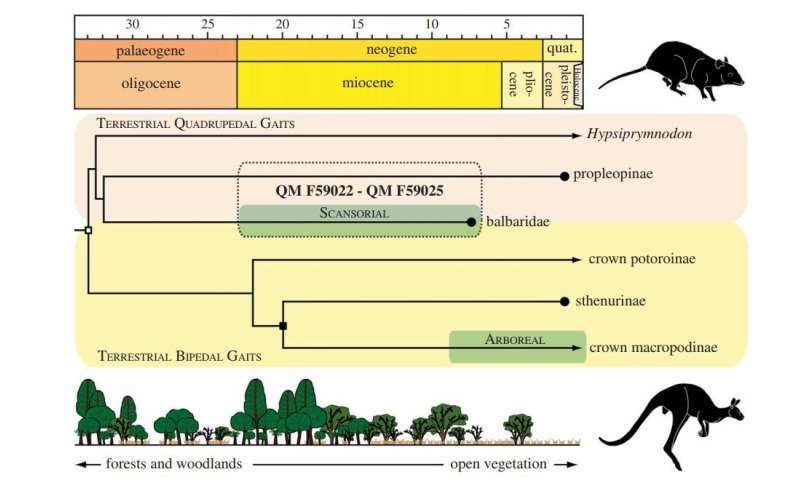 Prior research has suggested that the development of hopping was the result of a changing climate—Australia was once a lot wetter than it is today, with forests covering land that is now overrun with grasses. Standing upright in grasslands is advantageous, as can be seen in prairie dog behavior in parts of the U.S.; hopping is a way to move very quickly in such an environment, as observed with rabbits, most of which are also native to grasslands. 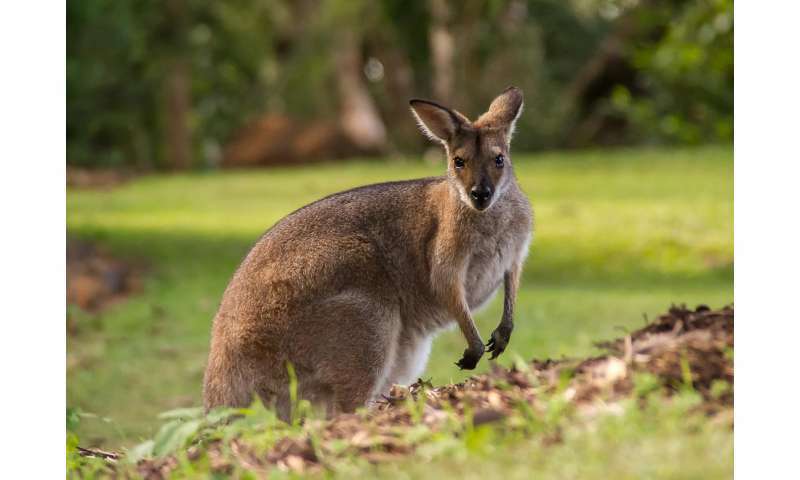 In this new effort, the researchers have found evidence that suggests hopping might have started long before grasslands took over large parts of Australia, casting doubt on current theories about the evolutionary timeline of kangaroo hopping. The work by the researchers involved studying the fossil remains of an ancient marsupial species called balbarids—they were distant cousins of kangaroos and went extinct approximately 10 to 15 million years ago. Recently, one of the most complete balbarid skeletons ever found was unearthed, providing the opportunity to learn more about both the species and the origin of hopping in Australian creatures. The fossils were dated to approximately 20 million years ago. To better understand how the balbarid and other close relatives likely moved around, the team built models of them based on leg, ankle and other bone shapes. In so doing, they discovered that some of the creatures were likely climbers, others crawlers, and some walked upright and hopped around like modern kangaroos. The researchers suggest these findings mean that the history of kangaroo hopping will have to be revisited, because if ancient ancestors were hopping around 20 million years ago, it seems possible that kangaroos were, too. How do kangaroos breathe while they hop?